Healthy residents of a posh assisted living facility are dying in the middle of the night … expressions of pure terror etched on their faces. After solving a series of unexplained deaths several years ago, forensic pathologist Dr. Bodhi King retreated from the limelight. Now, he’s called out of early retirement to help investigate a death cluster on a private island in the Florida Keys. Bodhi is thrust into a simmering conflict. Members of the Golden Island Church have a furtive agenda to protect. The dying Cuban-Americans have long-held secrets of their own. And everyone seems to have a reason to stop Bodhi from bringing the truth to light. 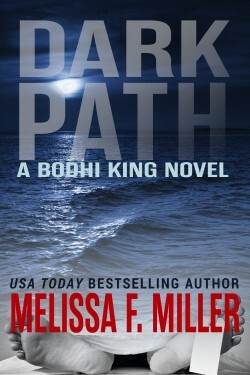 Dark Path is the first book in a thought-provoking forensic thriller series by USA Today bestseller Melissa F. Miller. Lonely Path (Book 2), Hidden Path (Book 3), and Twisted Path (Book 4) are available now!